Jeff is a pure contact hitter. A player who rarely strikes out and can play anywhere around the horn. Keppinger started that journey being selected by the Pittsburgh Pirates in the 2001 draft. Before he could reach the majors, Jeff was traded to the New York Mets, where he made his MLB debut on August 20, 2004. He spent time with the Kansas City Royals, Cincinnati Reds, Houston Astros, San Francisco Giants and Tampa Bay Rays. 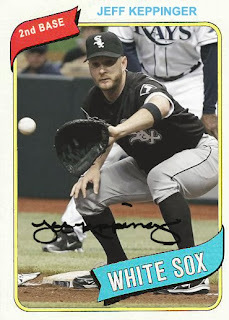 Keppinger signed a three year deal with the Chicago White Sox on December 10, 2012. His numbers have been slightly below average in 2013, but near enough to his career average that there isn't concern. Jeff has stepped into the revolving door at third base and stabilized the position for nearly one fourth of the 2013 season. Second base is where he logs the most time for the Pale Hose, but he had also seen time at first base and designated hitter. A bonus card from the 1982 set. David was born roughly an hour from U.S. Cellular Field in St. Charles, Illinois. He was first selected by the Seattle Mariners in the twentieth round of the 2001 draft, but did not sign. Purcey was selected by the New York Yankees in the seventeenth round of the 2003 draft, but did not sign. Persistence paid off, when in the 2004 draft, the Toronto Blue Jays selected David as the sixteenth pick overall in the first round. He made his MLB debut in 2008 with the Jays. On April 18, 2011, Toronto traded Purcey to the Oakland Athletics three years to the day of his MLB debut. He was traded a little over a month later to the Detroit Tigers. David spent 2012 with the LeHigh Valley IronPigs, a AAA affiliate of the Philadelphia Phillies. On November 15, 2012, Purcey signed with the White Sox. 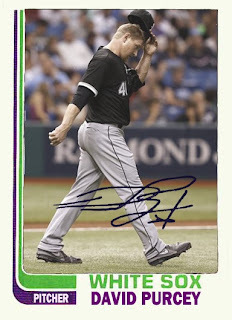 He made his ChiSox debut on July 5, 2013, against the Tampa Bay Rays, subbing for an injured Jesse Crain. After an atrociously high ERA in July, topping out at 9.00, David settled down in August and has lowered it under 1.50. Purcey has settled in nicely with Chicago. 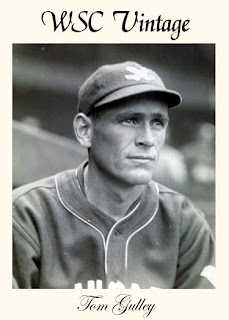 Tom made his MLB Debut with the Cleveland Indians on August 24, 1923, made two plate appearances, hit a double for his first hit and scored a run. He would make two more appearances for the Indians that year. Gulley would play in two games for them in April 1924, one in May and five in September. Tom did not play in the majors in 1925. Gulley made his White Sox debut on April 13, 1926 against the St. Louis Browns. His Sox debut played out much like his MLB debut, resulting in a double and a run scored. His average apexed at .33 on April 18th, but sputtered down to .229 by his last MLB game on May 22, 1926. While with the Pale Hose, Tom would spell Bill Barrett in right field, but was quickly replaced by Spence Harris as Barrett's backup. After Gulley's final game, Barrett and Harris would share duty in right field until September 1926, when Pid Purdy played nine games at the position. Tom Gulley's bat may have been his ultimate demise, but his fielding with the Sox was an impeccable 100%.